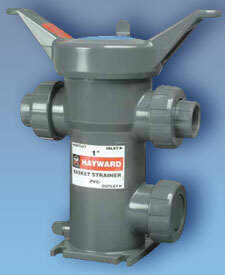 Hayward’s Model 72 Simplex Strainer has been the industry standard simplex basket strainer for over 75 years. It’s perfect for industrial and commercial applications where the line can be temporarily shut down for strainer basket cleaning or changeout. A few of the reasons for its popularity are, first, the unusually large basket capacity. The free straining area is at least 6 times the cross sectional pipe area (even more in many sizes). Next, no tools are needed to open the cover. The quick opening, swinging yoke can be disassembled and the basket removed in seconds. On sizes 4" and larger, a special cover clamp is provided to distribute the seating pressure and to insure positive seating of the cover. Another feature is a threaded drain on every size strainer (fitted with a plug). This can be used as a backwash connection, if desired. 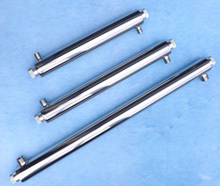 Sizes 2" and larger are provided with legs for bolting to the floor for rock solid installation. Wall thicknesses are exceptionally heavy. We have not stinted on weight to save material costs. The basket seats are precision machined to give a tight seal and prevent any material from by-passing the basket. The Hayward Model 72 Simplex Basket Strainer is a top quality, heavy duty unit designed to stand up to the most demanding of applications. There is simply no better simplex basket strainer made. 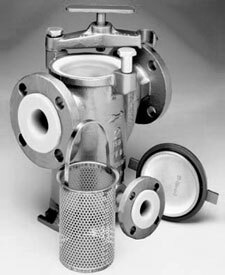 A continuous lining of advanced fluoropolymer resin makes the Model 72L simplex strainer an excellent low cost alternative to exotic alloy strainers in a wide variety of corrosive or abrasive lined piping applications. These applications include waste water treatment, paper mills, hazardous materials, flue gas systems, ultra pure water handling, chemical and petrochemical processing. The basic design of the Model 72L is that of our popular, time tested Model 72. The body and cover of the Model 72L are lined, not just coated, with Tefzel® – which protects all wetted surfaces of the strainer – making it impervious to attack by chemicals that can cause rapid deterioration of other types of plastics and all but the most costly metal alloys. The Tefzel fluoropolymer lining is inert to strong mineral acids, inorganic bases, halogens and metal salt solutions. Even carboxylic acids, anhydrides, aromatic and aliphatic hydrocarbons, alcohols, aldehydes, ketones, ethers, esters, chlorocarbons and classic polymer solvents have little effect on the Tefzel lining. Service temperatures can range up to 300°F in many applications. The lining also displays excellent mechanical strength when handling abrasive slurries. Fitted with fluoropolymer coated perforated baskets or mesh baskets made of Monel of Hastelloy C these strainers can be used in almost any lined piping or similar corrosive/abrasive strainer application. When pipeline system components require protection from dirt and debris and the line can be shut down for basket cleaning, a Hayward All Plastic Simplex Basket Strainer is the ideal choice. Unwanted particles are removed as the process media passes through a perforated strainer basket contained inside the strainer body. The basket traps the unwanted material while allowing the process media to flow freely. Changing or cleaning the strainer basket is quick and easy. The hand removable, spin-off cover features two angled handles for easy access to the strainer basket. The housing features external cover threads that do not contact the process media and never need cleaning. Venting and draining are made possible by two hand removable, threaded plugs, one on the top of the cover and the other on the housing side. 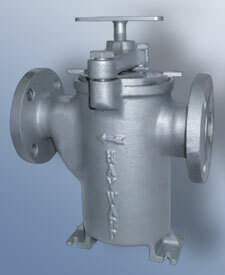 Hayward Simplex Basket Strainers can be installed either in-line or with loop piping configurations. This is made possible by a unique design that incorporates three piping connections on the strainer body that are used as inlets and outlets. The unused connection is plugged using a blind fitting (included). True union connections make it possible to remove the strainer from the piping system without disassembling the piping connections. Plastic baskets in perforation sizes from 1/32” to 3/16” are available. Stainless steel perforated baskets are available from 1/2” to 1/32”. Mesh stainless steel baskets for very fine straining applications are available in sizes from 20 mesh down to 325 mesh.